The Amalfi Coast is one of the most beautiful and famous areas of Italy. Its recent fame started in the 50's and 60's thanks to movie stars such as Humprey Bogart and Ingrid Bergman living "La Dolce Vita" here. Its fame still goes on today, many VIPs love the Amalfi Coast. Writers and composers such as Ibsen, and Wagner, already knew this part of Italy during their time, and used to spend the winter here, to take advantage of the mild climate. The charm and the beauty and the hospitality of the Amalfi Coast, Ravello, Sorrento and Capri make this the ideal setting for an unforgettable Italian wedding. Breathtaking views, history, traditions, and modern comforts, are all represented in Amalfitan life today, giving visitors the chance to have a relaxing and exciting time. Amalfi's origin dates back to the first century A.C. when the Roman aristocracy built luxurious villas in this area. Soon Amalfi, and its surrounding towns, became refined and well developed communities. Today Amalfi is a refined and modern town and an ideal location for a stunning wedding. Ravello, located at the top of the Dragone Valley, really seems as though it is a town and a garden, at the same time. Enclosing an endless number of amazing views, and examples of traditional architecture, the beauty of Ravello has been charming travelers, and artists of all nationalities for centuries. Some famous artists who have visited Ravello are, Boccaccio, and Wagner, as well as many others. The town of Positano is located in one of the most beautiful valleys of the Amalfi Coast, and the valley opens up to an equally magnificent stretch of coastline. At the center of town you can see the brightly colored "maiolica" dome of Santa Maria Assunta, the main church of Positano. As well as completing the picturesque view of this Southern Italian town, the church is also a very important part of daily life, for many locals. Sorrento offers many possibilities, you can enjoy a walk through the lively pedestrian only streets, or a day exploring the ruins of Pompeii. A short trip to Naples will take you to the National Museum that hosts some of the best frescoes and art work from Pompeii. The Amalfi Coast is just around the corner, or you can take a quick ferry to the Isle of Capri where you can shop like in Beverly Hills. Sorrento also hosts many spectacular wedding venues for both ceremony and reception. The small island of Capri is very close to Sorrento and Naples, it's celebrated for its beauty and as a coastal resort since the days of the Roman Republic. Capri, known in Greek mythology as the isle of the sirens, was a favored resort of the Roman emperors. Most notoriously, the emperor Tiberius had his villa on the island. The island is a world famous tourist spot, and a place of enchanting beauty. 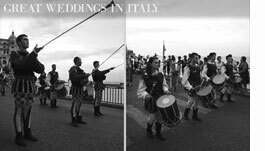 If you picked your venue on the Amalfi coast, and your wedding date is at the very end of August or the very beginning of September, you will be able to see the Capodanno Bizantino (Byzantine New Year's). This is one of the most ancient and spectacular Amalfi coast traditions.